In the ever more competitive American quest to create the most atrocious fast food imaginable, this new entry seems to have an edge on the competition. First of all, it only costs two dollars and sixteen cents. Second, it's composed entirely of "food" from McDonald's. In my wayward youth, I worked doing whatever needed doing at a beer distributor. Across the street was a McDonald's, and I knew a girl who worked there. She used to stuff extra burgers and things into whatever I ordered. 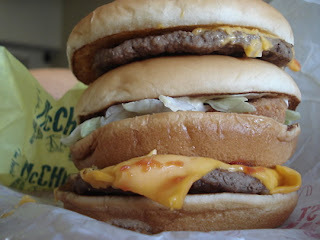 After overdoing it two days in a row, I decided there was something off about McDonald's products. Perhaps it's all made of plastic in different colors and shapes. Or maybe it's something else. Still, I haven't been able to eat there in decades and the very thought of it makes me ill.
Now, some creative genius has decided to take the double cheeseburger and stuff a "McChicken" sandwich in the center. Looks tempting, doesn't it? I wish you all a great weekend, and remember--the only thing better than going to McDonald's is not going to McDonald's.